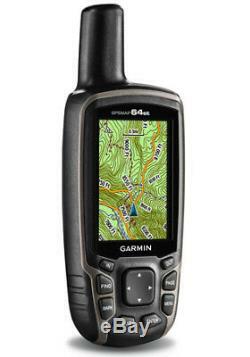 Garmin GPSMAP® 64st w/ Topo US 100K. 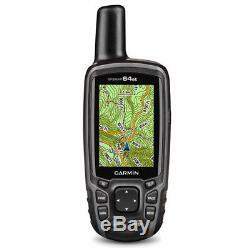 The Garmin GPSMAP 64st Topo US 100K GPS handheld receiver is a rugged, high-performance device with GLONASS and wireless connectivity. It features a 2.6 inch sunlight-readable 65K color screen that supports BirdsEyeT satellite imagery (subscription required) and custom maps. This waterproof handheld has a quad helix antenna for unparalleled reception. Other salient features include preloaded TOPO U. 100K maps, 3-axis tilt-compensated compass, a barometric altimeter , photo navigation. The GPSMAP 64st Topo US 100K locates your position quickly and precisely even in heavy cover and deep canyons relying upon its quad helix antenna and high-sensitivity. It also allows you to download satellite images to your device and integrate them with your maps. GPSMAP 64st Topo US 100K. 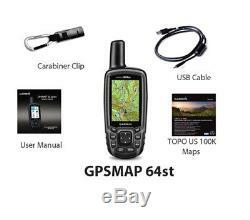 GPSMAP 64st Handheld GPS Topo US 100K GPSMAP 64st Handheld GPS Topo US 100K. 100K maps , 3-axis tilt-compensated compass, a barometric altimeter , photo navigation. GPSMAP 64st Topo US 100K Features. Sunlight Readable 65K Color TFT. 8 GB of Internal Memory. MicroSD&TRADE; Card Compatible (not included). Photo Navigation - Navigate to Geotagged Photos. Via Bluetooth® Technology1 or ANT+T. 10,000 Track Points - Navigate to Any Track Point on the Displayed Map. Garmin ConncetT Compatible - Online Community Where You Analyze, Categorize & Share Data. Fast Map Transfer w/ USB & Serial Port Interfaces - High-Speed USB & NMEA 0183 Compatible. Up To 16 Hours of Battery Life on 2 AA Batteries (Not Included). Weighs 9.2oz w/ Batteries. Please allow us the opportunity to resolve any issues before opening disputes and/or leaving feedback. If the item includes an ac power adapter for use, it will be 120 volts. Please ensure that this product is compatible with the standards within your country before purchasing. The item "Garmin GPSMAP 64st Topo US 100K GPS Handheld Receiver" is in sale since Monday, July 25, 2016.